Vadim_prog on: Offline LIFA Installation WITHOUT VI Package Manager!!! Tengo un problema para iniciar la utilizacion de LIFA por q no me deja cargar el archivo en la placa arduino UNO. Me gustaria que me colaboraran para solucionar este problema lo antes posible. Has fixed this problem someone? I have the same problem. I'm using LabView 2014 in win8. Board Arduino Uno and Arduino-1.0.6. Tengo el mismo problema. Hay alguna solución? Quizá con versiones anteriores de LabView no pase?? Cargar LIFA Base con esta version anterior "arduino-1.0.5-r2-windows.exe" u otras versiones antiguas como 1.01 IDE. El problema era al usar la version reciente "arduino-1.5.6-r2-windows.exe". Tenía el mismo error de TKD2. 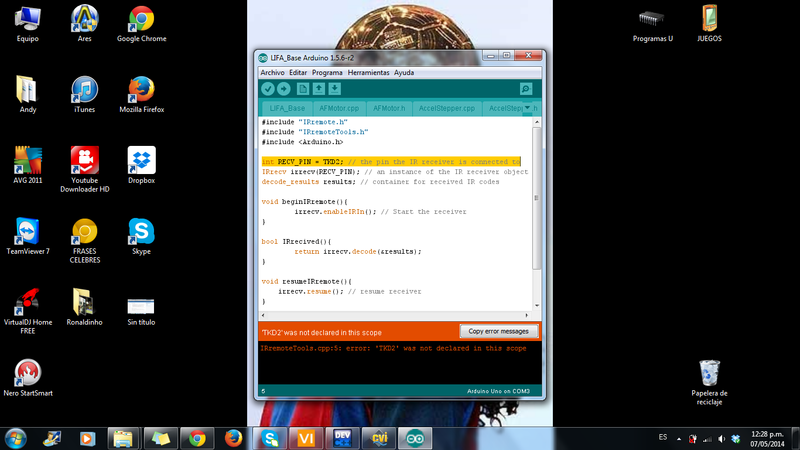 Probado con Arduino UNO en Windows XP sp3 y la version del compilador "arduino-1.0.5-r2-windows.exe". Poxa Fiz TODO Passo Certo, Demora pra caramba Baixar de Todos os Programas para no FIM aparecer ESSE Erro alguem SABE Como resolver ESSE problema. Al igual que raul_utb, solucione el problema al regresar a la versión arduino-1.0.5-r2, probado en Windows 8 Single Language de 64 bits. This happened to me, too. I tracked down the error it was referring to, (a file in the C:\Program Files (x86)\Arduino\libraries\RobotIRremote folder) and changed the name of the RobotIRremote folder just to remove it from the path, and it compiled fine after that. If you are using any files from there, it might be a problem, but for my purposes it didn't lead to any difficulties. If you are using any files from there, it might be a problem, but for my purposes it didn't lead to any difficulties. Facebook and Microsoft have had a relatively long-standing partnership when it comes to search: for years, Facebook searches would also show Bing results, and Bing queries have thrown up results from your friends. But history seems to mean very little to Facebook, which appears to have quietly killed Bing results. Note: If Arduino map is not in program files (x86) than it's where you have saved it. When you up loaded an Arduno sketch after using LIFA you over wrote your previous installation of LIFA . For the example you described you need to reinstall the LIFA base. to run LIFA. Gracias por la ayuda, this solution si me funciono. El Programa en sí incovenientes pecado de carga.